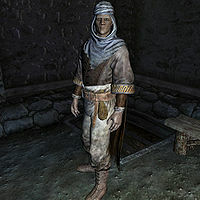 The Alik'r Prisoner, a Redguard scout, is one of Kematu's men who came to Skyrim to find Saadia. The Alik'r, led by Kematu, claim to have been sent after Saadia for speaking out against the government. This unlucky man was arrested for thievery and is being held in Dragonsreach in Whiterun. The Alik'r Prisoner wears an Alik'r hood, Hammerfell garb, and a pair of Redguard boots. During In My Time Of Need, you can pay the guard 100 gold to release him, and the prisoner will tell you that Kematu can be found in Swindler's Den, a cave west of Whiterun. Tell him that you need to find Kematu, and the prisoner will reply, "You have a death wish, then? If you know that name, you must know to meet him would be to meet your end. But it seems we both have needs, friend. Perhaps we can help each other out." Asking him what he needs will have him tell you, "I have dishonored my brothers by being captured, and so they have left me here. My life with the Alik'r is over now, but I have no wish to die in this gods-forsaken land. If I can be released from prison, I may start over. See to that, and I'll tell you what you want to know." You can then ask him how much his fine is, to which he'll reply, "100 gold will secure my release. You can afford that, can't you? I suppose you'd better hope you can, if you want the information. Get the money into the hands of one of these guards, and I'll tell you what you want to know." Telling him you don't have that much gold will have him end conversation with "Then we have nothing more to say to one another." Alternatively, you can ask him why the Alik'r left him. He'll answer, "Because I was clumsy enough to be captured. Kematu always says we're supposed to be the best of the best. I wasn't." Prisoner: "Guard! My fine's been paid, now set me free!" Guard: "Sorry, my ears aren't so good. You say somethin'?" Prisoner: "I said my fine has been paid! Now let me out!" Guard: "Right, right... Oh, look at that. I seem to have lost my keys. Might take me a while to find them. You just sit tight. I'll get around to it eventually." He will remain in the prison constantly, and is never actually released regardless of anything you do. Even if you open his cell door, he will not attempt to escape. This page was last modified on 20 September 2016, at 09:39.